Add A Little Sunshine To Your Day! While visiting one of my favorite blogs, Food Blogga, I noticed this delicious sounding recipe - Honeyed Orange Ginger Muffins (Quat, Optional). The creative and daring, Susan created this recipe using orangequats. I have never had nor seen an orangequat, but no problem because Susan made the recipe "quat-optional", substituting with naval oranges. One look at her luscious muffins and I knew I had to make some. I altered the recipe a bit for a few reasons. One, like I said, I have never seen orangequats in my supermarket, so I used naval oranges as Susan suggests. 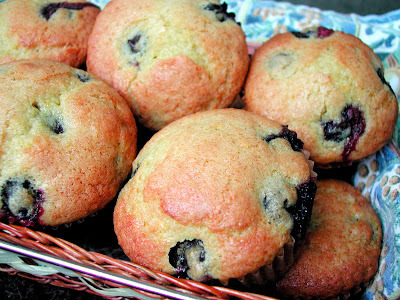 Two, I had my Mom in mind when making this recipe and she loves the flavor of orange and blueberries, but does not like a spicy flavor and usually prefers her muffins with less sugar. So I substituted blueberries for the raisins and changed the minced ginger to half the amount of minced candied ginger. I also reduced amount of sugar and opted for organic unrefined sugar. I think they came out great; very tasty and light. I don't know how it happened but I ended up with extra batter, so I made 10 mini muffins with the left-over batter. (Very dangerous, because they are very "pop-able", and I popped quite a few in my mouth without hesitation). Although, I didn't really feel that bad because these muffins are fairly low in fat, using canola oil and only one egg. Thanks for the inspiration Susan! Place rack in center of oven and preheat to 350 degrees F. and set on convection, or 375 F. for conventional oven. Spray a 12 mold regular size muffin pan with cooking spray or use paper muffin liners. In a separate bowl, whisk together oil, egg, and juice. Add the orange pulp, orange zest, ginger, honey, and vanilla, and whisk until just combined. Add to the flour mixture and stir quickly until well combined. Toss blueberries in the reserved teaspoon of flour until evenly coated. Fold the blueberries into the batter. Spoon the batter evenly into the 12 molds. If you have extra batter, spoon into an additional muffin pan. (I made 10 mini muffins). 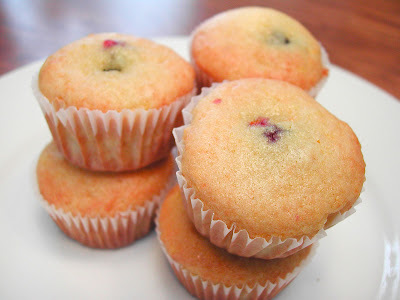 Bake for 12-15 minutes for regular sized muffins, and 8-10 minutes for mini muffins, or until the tops are golden and a cake tester inserted into the center of a muffin comes out clean. Transfer the pan to a rack to cool for 5 minutes before removing each muffin and placing on a wire rack to cool. Beautiful muffins! I don't think you can beat a blueberry muffin. They are the best. I would probably pop quite a few mini muffins into my mouth. Yes mom liked them,she loves bluberry a lot she even eats blueberry yogurt.Thank you Annie,bambola. These look yummy. I just got a new mini muffin pan at Williams Sonoma today! Hmmmmm....plans coming? Ooh, I'm so happy to hear your muffins turned out so well, Annie! I love the addition of blueberries. I may be trying your version of my muffins now! :) Many thanks for your kind words.